Amazing Block building Fun! Create & Play! All the Fun of Block building & No Mess! 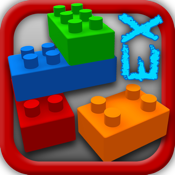 Express Blocks is the Free version of wildly successful brick building app Blocks! Once you've mastered Express Blocks, move up to Blocks for more power and more Block Shapes! Build anything you can imagine and bring your Dreams to Life on your iPhone, iPad, iPad Mini or iPod touch. Create, Move, Build & Dream in 3D Space! 'If you have the love to build - If you have an iPhone in your pocket or an iPad in your bag - Blocks! is an app for you!" "...Blocks! is an App you need!..." Building is easy, use iOS Finger Gestures for Block building control! 'Fly' through 3D Space using your Front Camera and our amazing FCP* Technology! We call it Face-Coupled Perspective, but you'll call it Awesome! Tap "?" any time for the Full In-App Tutorial! Set Camera Speed for perfect Play Board movement. If you get 'lost in space', try the Camera Reset! Blocks Express is a Universal App, that means 1 App for iPhone, iPad and iPod touch! If the Ad Networks are a concern, consider the full version for more Block Shapes and no Ads, just search the App Store for "Blocks!". Your Feedback is Important, please leave Great Ratings and Kind Reviews on the App Store! It's easy to start building! Tap a Block Button to Select, or Tap again to assign other Block to the Button. Tap the Play Screen to Set a Block. To move a Block, Tap to Select & Tap and Drag. Tap again to Rotate a Block; the last rotation Deletes the Block. If you make a mistake, just Tap the Un-Do Arrow! To Stack Blocks, Tap and Drag a Block onto another, the Block 'stacks' over the other Block when they 'collide'. To Move, Cut, Copy or Paste Multiple Blocks: Select Finger Button in a Block Menu. Tap Blocks to Select. To move, Tap & Drag, then Tap on the empty screen to de-select. To Cut, Copy or Paste Selected Blocks, Tap the Settings Button on the Left Menu and Tap Cut, Copy or Paste. Tap Eye Button to turn on/off. Vertical FCP Default is Off; Toggle is in Settings. Move head to Rotate Build, to keep moving, stay in direction of movement, return to Stop or move back. When you leave camera, FCP stops. Please give some time to get used to Virtual Object Movement! * FCP Requires iDevice with Forward Facing Camera. All data and info ©, ™, ® mobile i Software, LLC 2010/2013.